A new brewery broke ground Friday in Avimor and it is just one of several major projects planned for the Boise Foothills community. BOISE, Idaho — The Avimor community is continuing to grow a decade after it was first started. The first homes popped up in Avimor in 2008 and since then, more homes and businesses have been making their way to the community - located just off Highway 55 in the Boise Foothills. Avimor is 23,000 acres, or 35 square miles, of land, which includes hundreds of homes, a community center and miles of recreational trails. On Friday, a new brewery broke ground in Avimor as one of the first business in the community. Spring Creek Brewing will have 20 to 25 employees once it opens. Using a 7-barrel steam system, there will be several local brews to choose from. The brewery will also have soups, salads, and wood-fired pizzas. One of the brewery’s co-founders, Marc Grubert, said eventually they would like to be able to offer pizza delivery throughout the Avimor community. He said they would like to do so on bicycles to help the environment stay eco-friendly. Grubert said the brewery will also have a short trail that goes to the nearby Heritage Park. He said they will also offer a lot of outdoor events when weather allows. 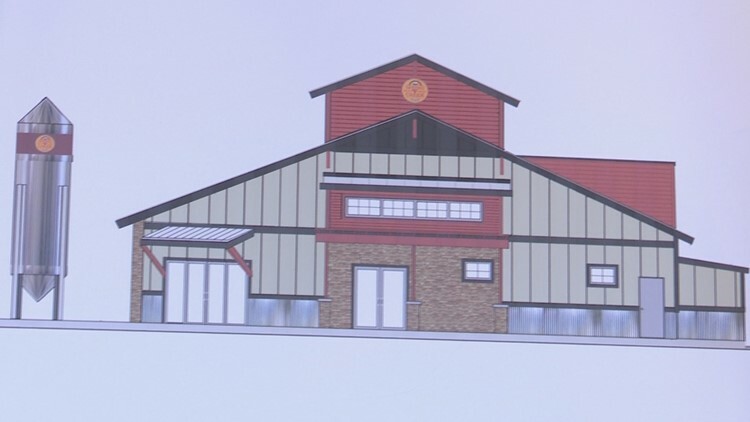 A drawing of what the Spring Creek Brewery in Avimor will look like when its built. Jeffrey Badigian, the other co-founder, and Grubert are long-time friends. Badigian said they both lived in California and separately, decided to move to Idaho. He said they unknowingly picked the same area in Idaho to relocate and were eventually reconnected through social media. Grubert lives in Avimor and said they decided it needed a brewery. Fast forward two years later and the brewery is set to be built. “That’s really what started this whole concept, was just a backyard party between two friends and here we are now,” Badigian described. Ninety different private investors raised half a million dollars to help fund the brewery – and most of those are Idaho residents, including several from their community. While Friday was the groundbreaking for the business and the grand opening for the brewery is planned for September. But Spring Creek Brewing is only one part of Avimor’s continued growth. “The last several years, it’s just each year, we’ve shown incredible growth,” said Dan Richter, managing partner for the Avimor Group. Even Grubert said the last few years has really seen a boom. “I’ve gone from no neighbors to roughly about 400 neighbors,” he said. According to Richter, even more is planned for the growing community. Coming soon is an events center to host weddings and other functions. The center will include an amphitheater and even a vineyard and tasting room, with grapes being planted as early as this fall. Richter said another 100 to 120 homes will also be built in 2019, which would add to the existing 400 occupied homes and another 60 already under construction. Richter said one thing Avimor wants to do is have affordable housing. MORE: Growing Idaho: How is growth impacting the housing market? Those homes went on sale two weeks ago and all 12 available sold out same-day. But Richter said they hope to have similar projects like it in the future. “We want a community everyone can live in, not just the wealthy,” he said. The first phase of Avimor is Village One, which is part of what’s there now. Eventually, the village will be about 900 acres and include more than 800 homes plus businesses and other features. Village One is expected to be complete in the next two to three years. Richter said he’s had interest from other people in adding things like a live-work center, a possible coffee shop, bike shop, and even a day spa. “It’ll take several decades to build so the growth you see now will continue to speed up over the next few years,” he said.